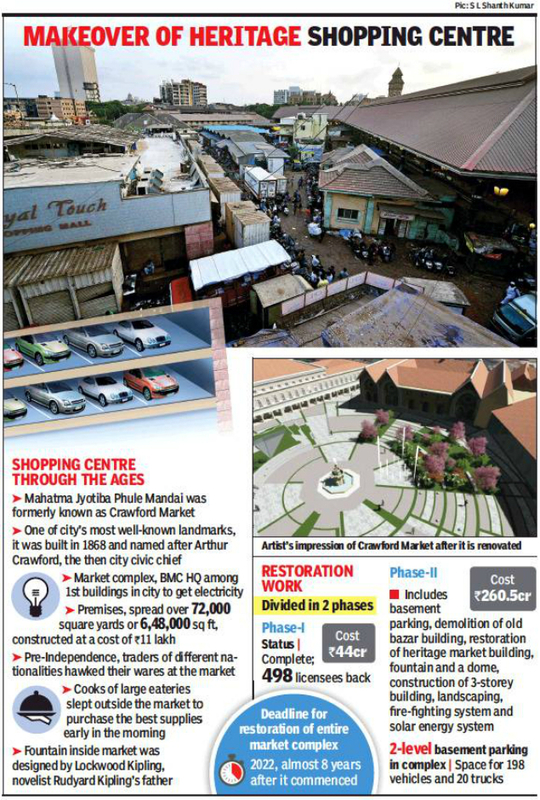 MUMBAI: The restoration and repair work of the historic Crawford Market, also known as Mahatma Jotiba Phule Mandai in south Mumbai’s Fort area, will include a two-level basement parking for not just cars but even trucks that require space to load and unload material for shopkeepers. The much-needed parking space will help ease the traffic situation in the congested zone. The BMC, which is carrying out the restoration, has set itself a 2022 deadline to complete the work, almost eight years after it began. The restoration project has been divided into two phases. Work on Phase-I was completed sometime ago and 498 licensees had shifted back to their former places in the market. Phase-II includes construction of a basement parking lot, demolition of the old bazar building, restoration of the heritage market building, a fountain and a dome, construction of a three-storey building, landscaping, a fire-fighting system and a solar energy system. The BMC’s restoration plan recently received a shot in the arm after a special leave petition (SLP) filed by Mahatma Jyotiba Phule Mandai Shopkeepers’ Association licensees against the ongoing restoration work was dismissed. Sangeeta Hasnale, assistant municipal commissioner, markets, said, “According to the earlier 2004 policy, market associations could themselves redevelop a municipal market by appointing their own architects and developers. But the corporation would not have benefited from the redevelopment proposals in terms of incentives to be shared with the developer and the corporation. Therefore, the BMC itself decided to undertake the repair and restoration work by engaging an architect from the civic panel. The restoration of the heritage market began in September 2014. As it is a Grade-I heritage structure, deemed to be of national or historical importance, no major structural changes are allowed. The BMC did not want to evacuate the whole market for the restoration work and thus decided to carry it out in phases. The clock tower wing, which had around 15 shops, was the first to be restored. The association had expressed disappointment over the renovation work. It had alleged that the sample shops shown to the shopkeepers were different from those constructed and handed over to them.